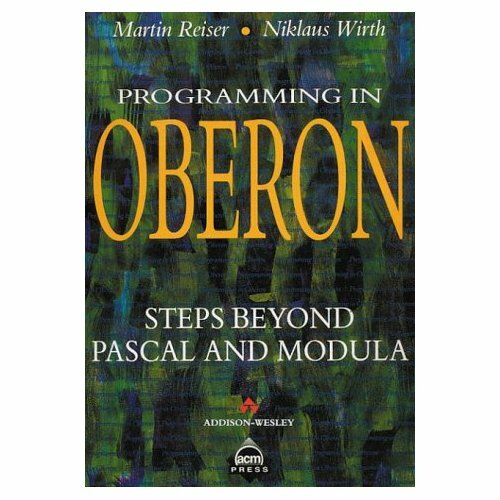 This is a book about programming, and in particular about programming in the language of Oberon. It's a language that is defined in terms of relatively few, fundamental programming concepts, rigorously structured, and efficiently implemented on modern computers. These are essentially the same reasons that years ago spoke for the language Pascal. These properties encourage an systematic approach to the designs of the programs, and are the prerequisites for using the essential technique of modular design based on abstraction. Oberon is a 'small' language which makes it particularly suited as notation for an introduction to programming. Yet its concepts are general and powerful, making it equally appropriate for the construction of large software systems. These claims have been substantiated by the use of Oberon both in teaching and in the design of the Oberon System itself. Writing a book on programming poses many challenges, in particular how to choose the order in which concepts and constructs are introduced and how to choose examples that are exciting and realistic, yet rely solely on material explained earlier in the text. The book's approach is distinguished in two ways: the procedure and module are introduced early, right after the control structures, and the examples share a common theme: simulation. In the end, a complete and realistic simulation package is obtained.